Macintosh. Honeycrisp. JonaMac. Gala. Macoun. Empire. Turley Winesap. Mountaineer. Fuji. Rome. Redmax. Grimes Golden. Shijuka. Pink Lady. What kind of apples do you see in the market? I love apples. Apple pie. Apple Crisp. Apple Fritters. Baked Apples. Apple slices with peanut butter. Gorgonzola Apple Walnut salad. Waldorf salad. Out of hand, an apple polished up on your jeans, eaten in the garden on a crisp fall day. When I found this recipe somewhere on the web years ago, I was thrilled to have a way to enjoy apples in jam form. This sweet, caramel flavored, traditional style jam (firm set) is not only wonderful on toast, but warmed and spread between layers of yellow cake? Divine. Or spooned into mini tarts. Mmmm. Oh, fill cheddar thumbprint cookies with this jam. So unexpected. Or back to the grilled cheese sandwich (you’re going to think I’m obsessed) – try sharp cheddar and apple pie jam on multi grain bread. Slip in some thin slices of apple, too. 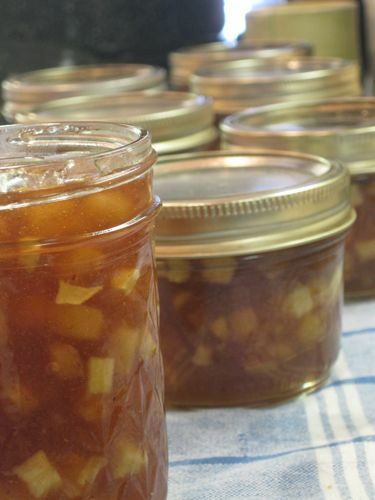 This is a great jam to practice using commercial pectin. It’s easy as – well – pie! To avoid fruit float, be very mindful of the timing. One minute means sixty seconds. At a BOIL YOU CAN’T STIR DOWN. That’s seriously boiling. Sixty seconds. No more. Fruit float is often caused by over processing, and that’s the trickiest part of this recipe. I’ll be demonstrating this recipe at the Capital Home Show this Friday, September 24 at 1:30. Come introduce yourself! Peel and finely dice the apples. Pack them firmly into a 4 cup measure. 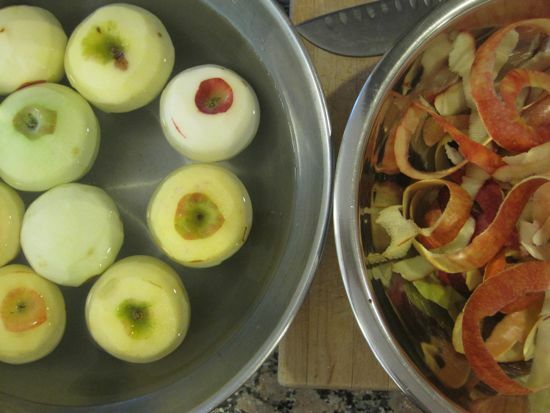 Add water in between all the apple pieces to fill to 4 cups. Bring the mixture to a full rolling boil that cannot be stirred down. Add both sugars, stir well and bring back up to a full rolling boil for EXACTLY one minute. Do not stop stirring. Remove from heat. Stir in the pinch of butter to reduce the foam. Skim off any foam that remains. Ladle into hot, clean jars leaving 1/4″ headspace. Wipe the jar rims and threads. This sounds so delicious, I just might have to make a batch. I SO wish I was going to be in Washington this weekend to attend your demos! I would clap the loudest, too!! First summer of canning adventures and I have not seen this type of pie filling recipe in my recipe travels. Will definitely have to try it out within the next week or two. And I am local to DC and would love to visit the Home Show. I’m with Gail, need to jump in the tub with this jam. The site looks incredible. Just beautiful. And I’m going to make this jam next week to store alongside my gleaming pots of gelee de pommes. I’m off to Twitter with @Vinoluci to get them to work the same magic on my site. Time to say goodbye to Blogspot and embrace WP. Thank you for the inspiration! What a cute header! Your site looks great. And that pie is calling my name! Congrats on your new domain. And apple pie in a jar! Zoinks. I planted a Pink Lady this year. Here’s hoping I’ll be able to make this next year with the proceeds. I cannot wait to try this recipe. I am so greatful I heard about you on NPR. My Mom always cans every summer and this was the 1st summer I have tried it. My husban is very happy with the results and my friends will be happy at Christmas time. Thanks so much! Hooray! 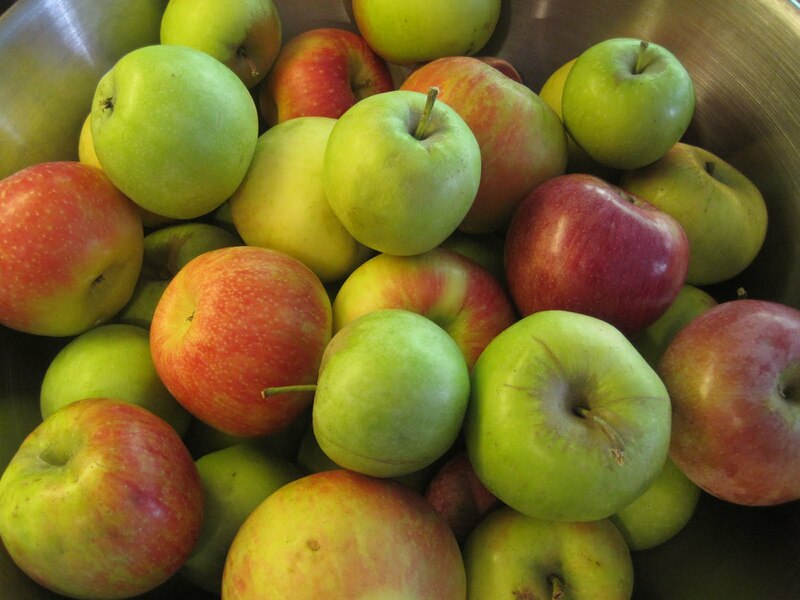 I was overzealous last week when I went apple picking and I needed something to do with all that are left….Mrs. Wheelbarrow to the rescue. Thanks so much for this gem! I had a recipe for apple pie filling that I’ve made from several different ones and just had to give your jam a go. I made 14 pints today with Honey Crisp and Galas. They are cooling and firming as I type. Did I have fruit float, heck yeah, I did, but I’ve been shaking the jars and its finally starting to suspend itself. I follow the directions but for some reason, I find myself shaking fruitjars a lot! I tasted the pan drippings and its just heavenly. Thanks again for the great idea. Jeffrey and I made this jam tonight. First batch had a bit of foam, which wasn’t enough to skim (slightly larger apple pieces? ), second batch hardly had any at all. No fruit float in either- excellent directions! There was a tiny bit that didn’t fit in a jar, so we poured it over ice cream. Heaven! Thank you so much! Really…when I was working on your site, this was just a post to work with…where should they go, how positioned, what size the photo, you know. 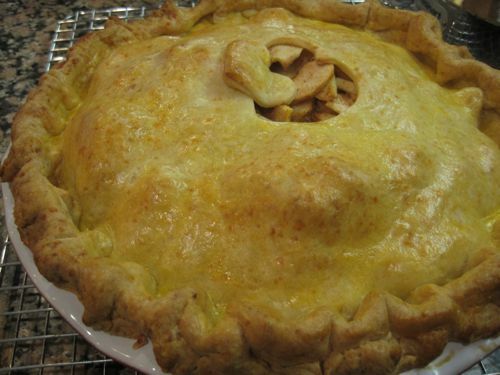 But now today, I’m making an apple pie and I GET IT! To have this amazing smell available in a jar would be heaven. I think my days of canning in the past, but I’m very tempted to resurrect that long buried equipment. I’m not kidding. I cannot wait to make this next weekend when we hit up our local orchard! My question for you is, have you used Pomona’s pectin at all? I want to try it out, as our CSA farmer has recommended it to me. Would it work well with this? Dang! I just made a batch of this and my fruit is floating 🙁 I followed directions to the T too 🙁 Me and pectin just don’t mix!! It still taste yummy though!! My jam didn’t set up but I tell you what, it tastes delicious anyway! Instead of jam I’ll be using it as ice cream topping. I can’t wait to try again, however!! Hopefully it sets up this time. Anyway I can modify this for a diabetic? Sorry, Beth, I don’t know anything about that! I tried the recipe over the weekend and it came out pretty good! I don’t think I used enough apples but it still tastes really good! It was my first time canning by myself and I ran into a few issues with the jar lifter. I was going to use the metal rack but my jars didn’t fit into it well so I just put a pie cooling rack at the bottom of the pot instead and used a jar lifter to get the jars in and out of the water bath. Somewhat of a disaster…any tips would be appreciated! 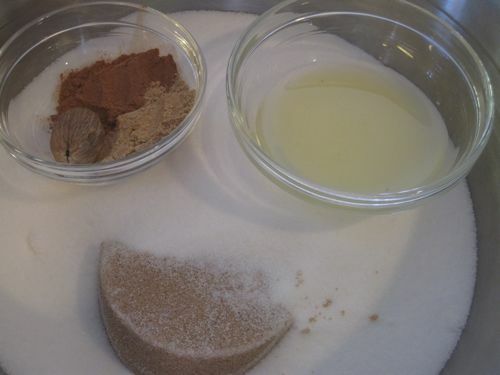 Hi Allison, So great you tried the recipe! Here are a couple of tips – regarding the amount of apples. 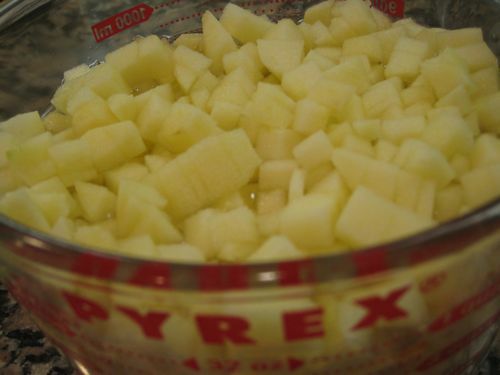 It’s important to get a small dice so you can cram a lot of chopped apples into the four cup measure before adding the water. Next, the rack. I have to say, I hate the rack that came with my canner. I do the same thing and use a pie cooling rack at the bottom of my pan. Then, the jars go in and out rather easily. The jar lifter (the largish tong-like tool) grips the jar right under the ring and with that nice non-slip, rubberized material, will help keep the jars from tipping. I made this jam over the weekend, it was easy and is SO SO good! I took your idea of the dressed-up grilled cheese sandwich, and it really was wonderful. My apples ended up more cooked than yours I think because mine were pretty much clear or turned completely to sauce in the jam, I guess maybe mine cooked longer? I did make a double batch, so that might have accounted for it. . . thoughts? Hi Bridget, Different apple types break down in cooking in different ways. I use MacIntosh, Honeycrisp, Matsu and other super crisp apples to keep the pieces from breaking up. As to doubling the batch, most canning sources recommend against doubling recipes. (I’ve done it before but don’t now – I usually ended up with something not quite right – the set, or the fruit is overcooked. Thanks Cathy, that’s helpful. My jam set up beautifully, but I would like more distinct & firm apple pieces next time. Thank you for the advice! I still have a lot to learn but I’m having fun while doing it. Definitely going to try the recipe again! This was my first shot at making jam…. and it worked! No fruit float and I tested to see if the jam would set on a cold plate and it did!!!! Although, I used all the same measurement as in your recipe and somehow my batch doubled. Not that I’m complaining 😛 Can’t wait to try it. This sounds so good I want to try it out. But, we have such random sized apples from our neighbor’s tree. I’m wondering, do you have an approximation for the # of pounds of apples you use? I had issues with another jelly recipe not setting last week and would rather get it just right this time. I think jams require more precision than I am used to for cooking! When calling for 1 box pectin, did you mean liquid pectin or powder form in this recipe? Made this yesterday and it’s GREAT!! It ended up making 7 half pints and I only needed 6 apples to fill a 4 cup measure. All depends on the apple size I guess. I used Cortlands and Gala’s. Yum!! I made one batch and some jars set and some didn’t. My daughter, who is a chef, said to make sure I kept stirring and dipping down as I ladled it into the jars as the pectin part tends to settle to the bottom, which would account for the fact that the latter jars set better than the first! I’m making another batch this weekend because the people I gave the first batch to said they are all gone! this recipe is sooo yummy! I´m in Mexico right now and need to know the measure of a box pectin…how many grams on it ?? I just made this recipe it is so delish… The box of sure-jell that I used is 1.75 oz / 49 grams… Hope this helps. i just made this jam, and it is so good! I’m planning to put it on top of baked brie for an Thanksgiving appetizer! Thank you! Just made this and the recipe is pure perfection!! Delicious and a success! I love this recipe… I have made it twice and it tastes wonderful and looks beautiful. Hi – Can you use the low sugar pectin or do you use the regular box of pectin? I have made this jam for 2 years now. It is delicious and everyone loves it. While cooking it it did made the house smell liked fresh baked apple pies and tastes just like it on fresh baked biscuits. Thank you for sharing the recipe. Thank you so much for sharing. I will definitely be adding this to my yearly canning recipes! 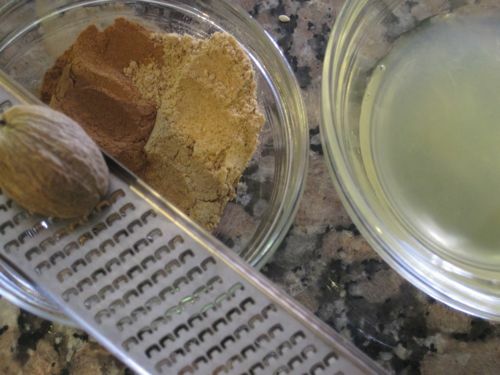 My daughter told me about this recipe and how much she and her husband love it. I made it today and it is delicious. I did find it a bit on the sweet side and was wondering if reducing the sugar by 1/2-1 cup would alter the recipe’s end result. Thank you! Because this recipe uses commercial pectin, you can’t alter the amount of sugar. Either eliminate the pectin and try cooking the jelly until it reaches the gel stage or try using a low-sugar or no-sugar pectin. Ugh I have fruit float! Can I still use the jam? Should I just stir it before my first use? Want to tray this but worried about fruit float. Is there a sure proof way to avoid that?